Afternoon and evening social events for young adults to discuss the big life issues while playing games or learning new crafts or skills. The cafe atmosphere is relaxed and there is opportunity for cross generational interaction and the transfer of cultural skills such as wood carving, sewing, music, arts and crafts traditional cookery, etc. more effective in dealing with awkward situations. They learn to deal with criticism, say ‘no’respectfully, state their needs and deal with requests and demands. They are helped to feel better about themselves and become more encouraging and positive, especially in their own families. Developed and produced in co-operation with Barnardos. respectful skills and thus reinforce change within whatever family system they live in . The emphasis is on growth in self-confidence, saying ‘no’ to peer pressure and finding fairer, less aggressive ways of dealing with problems. 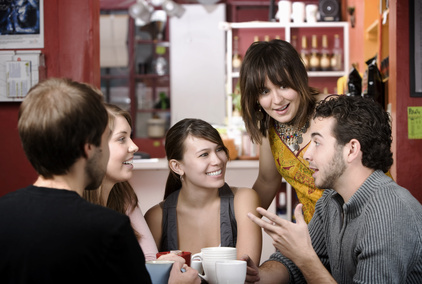 Youth Clubs, church groups, local coffee shops who welcome teenagers, charities, etc. Programme outcomes: The course builds self-esteem and confidence, and equips young adults with an awareness of alternative ways of behaving. Skills that are useful in dealing with unwelcome peer pressure are acquired.